I’ve recently been finding myself wanting to hear from Martin…wishing he was with me and I could talk with him. The closest I could come to that was to read over some writing he did when he was in my class. 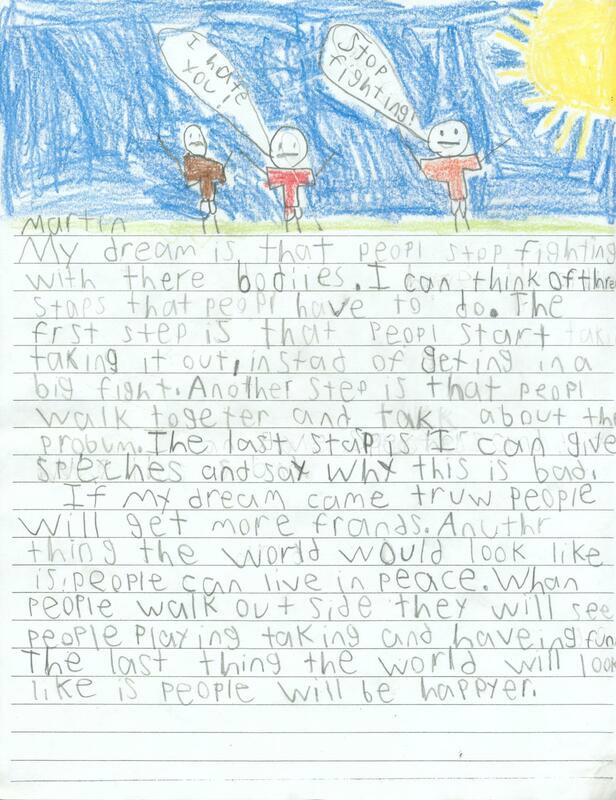 I found the following piece he wrote about a dream he had for the world to help make it a better place. I wanted to share it with you, because I think it really speaks to what Martin would want us to do – to go out and bring peace to help make the world a happier place. In your moments of deep sadness, I hope his voice can help console you, and also inspire you to not stay in the sorrow, but instead be prompted to help fulfill his dream. I promise to do it and I hope you will too – we can do it together.